Aren't coaches and managers contractually obliged to speak to the press post match? They're obliged to put someone from the coaching staff up for interview, could be anyone really. Can't wait until hazard leaves. I'm not sure how that can be? He's one of the best players in the league on his day and if he leaves it will only damage them. Oh absolutely - and when "on" can be a big part of a title winning team. He's also the first player to down tools when things don't go his way. He's torched Mou; he's torched Conte and and now he's torching Sarri. He's a great player but an absolute cancer in the squad. A half arsed Hazard is still one of the best players in the league. We sent Poyet to do that instead of Ramos back in the day. I think the implication is that Coutinho leaving helped Liverpool rather than hurting them. if the table stays this way, we can reuse our posters next season! Coutinho is only half the footballer Hazard is too. Not sure I see it that way just yet. That's only one player and they've played Liverpool twice now too so can't roll over and have their belly scratched. Not sure where they're getting the confirmation that Fraser is joining the in the summer either. Thought that was a bit odd. Wolverhamptons Wanderers V Newcastle United. Conclusion based on another conclusion that was based on a number of assumptions. 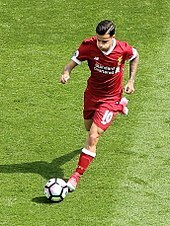 Facts are that Coutinho was one of their better players (supported by big money transfer to a most desirable club) whose transfer was deemed by many to be a big negative blow for Pool. Pool ended that season in the CL Final and have led the PL for much of the subsequent season ie they have improved upon their previous form and results with Coutinho. if he leaves it will only damage them. I find such statement, without further qualification, to be ludicrous when such high profile evidence to the contrary is so close in the memory. So yes, very, very relevant.